One of my favorite things about the blogging world is seeing our blog friends have all sorts of crazy success. After writing three books (if you haven’t checked them out and you’re dying to, you can find them here, here, and here), we know all the blood, sweat, tears, stress, feeling like throwing in the towel on everything in life, exhilaration, and satisfaction. So basically feeling all the feelings. 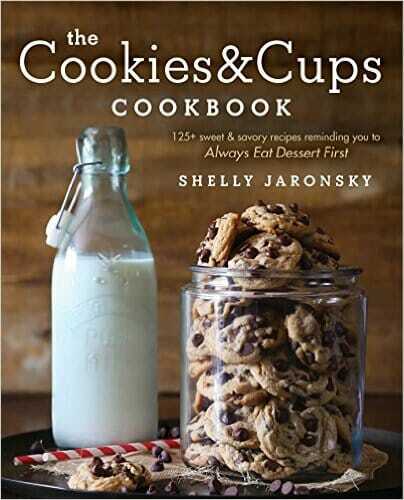 We’re so excited to show off our friend Shelly from Cookies and Cups and her gorgeous new book that has lots of sweet treats as well as easy dinners–you know, to kind of keep things in balance. 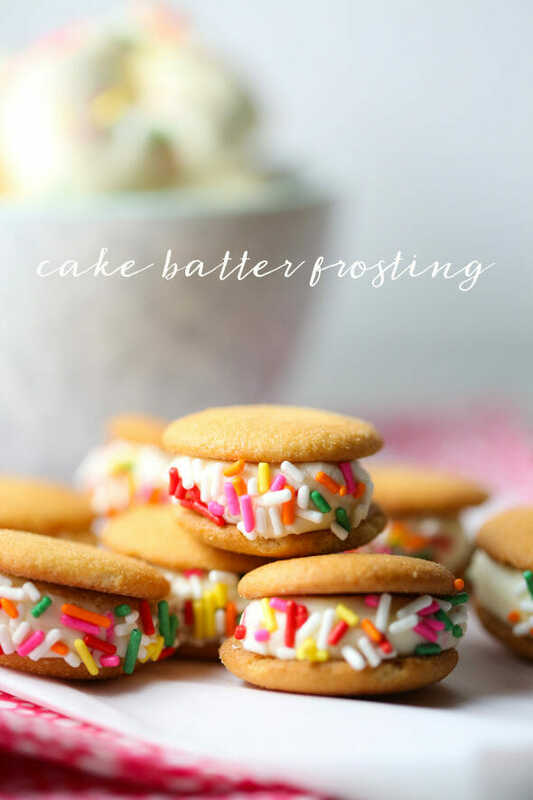 We love all things frosting around here, so the fact that there’s an entire section devoted to various frostings brings out all sorts of happy feelings (as well as all the fat pants, but that’s another post.) 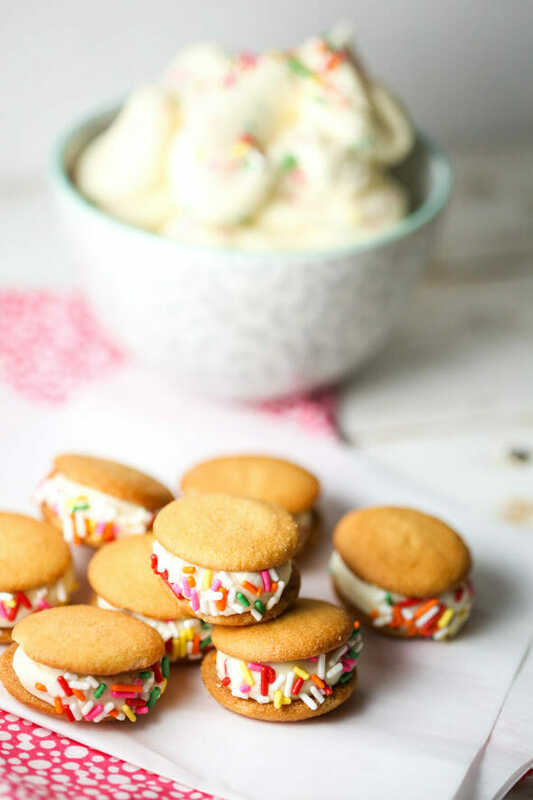 And while sprinkles taste basically like nothing, I am so attracted to them–like, if you give me a plain ice cream cone and one with sprinkles, I’ll pick the sprinkles every time even if there is literally no discernible taste difference. I’m a simple girl…all I want is for someone to do my dishes and bring me food with sprinkles on it. 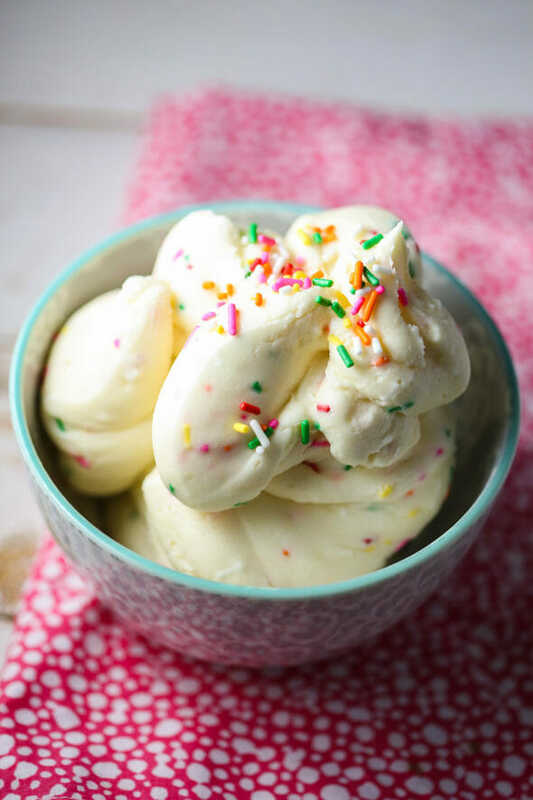 This recipe for Cake Batter Frosting basically has everything you need in life–butter, powdered sugar, cream, sprinkles. Oh, and cake mix because for whatever reason, cake and brownie batter is irresistible. In the bowl of a stand mixer fitted with the paddle attachment, mix the butter on medium speed until smooth. Turn the speed to low and add the cake mix, powdered sugar, and cream, mixing until just combined. Turn the speed back up to medium and beat for an addition minute, until the frosting is smooth and creamy. 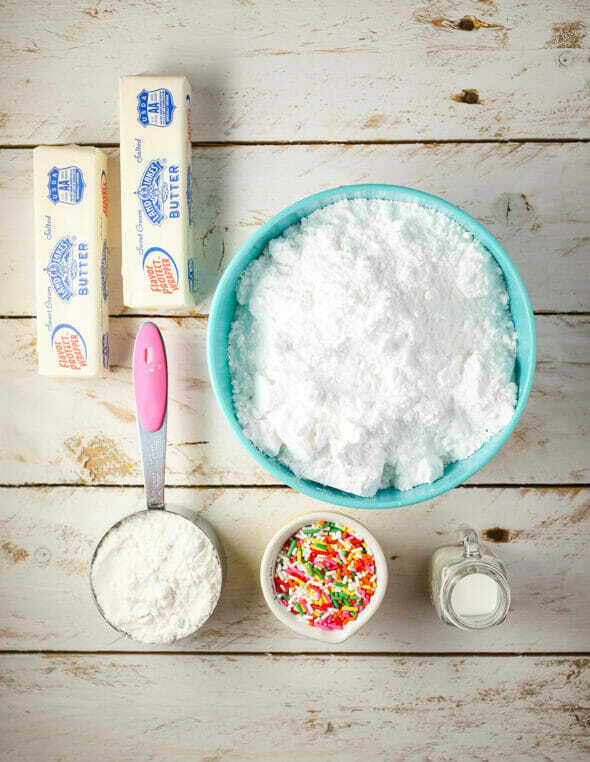 Add the sprinkles and mix on low until incorporated. Now…if you’re one of those people who say, “Frosting is just too sweet for me,” this frosting probably isn’t for you. 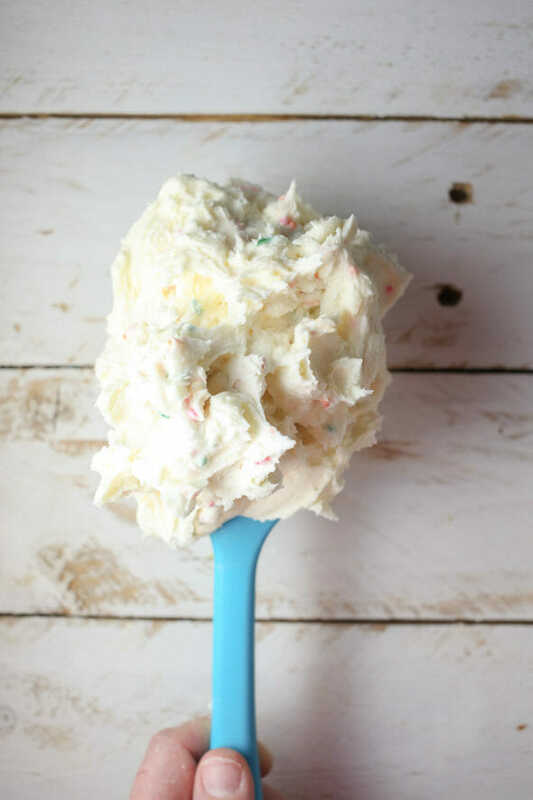 If you’re one of those people who say, “I love frosting and I love cake batter,” this frosting is definitely for you. Spread onto graham crackers, Nilla Wafers, or your finger. Whatever. WE’RE TALKING ABOUT RAINBOW SPRINKLES HERE, all rules go out the window. Makes 1 1/2 cups frosting. Spread onto graham crackers, Nilla Wafers, or your finger. Whatever. WE’RE TALKING ABOUT RAINBOW SPRINKLES HERE, all rules go out the window. Makes 1 1/2 cups frosting. Store airtight at room temperature for up to 2 days, refrigerated for 5 days, or in the freezer for 1 month. If refrigerated or frozen, allow tht frosting to return to room temperature before using. THANK YOUUUUU! I need a bowl full of that right about now!! Bring on the fat pants! This frosting looks incredible! I need it in my life asap! Amazon is bringing me her new book tomorrow and I cannot wait!